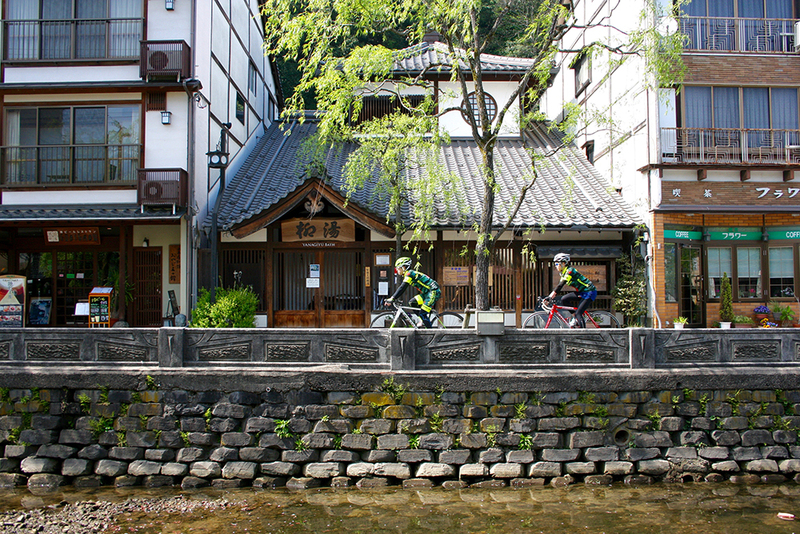 How does the Onsen Town complement cycling? One possible retreat is the Yanagi-Yu, the willow onsen, the smallest Sotoyu and known for its free foot bath. 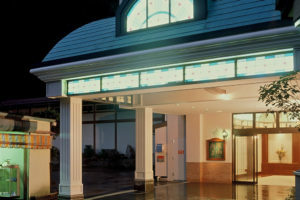 Kinosaki Onsen is located in Hyogo prefecture on the Sea of Japan coast. It is seeped in more than 1,300 years of history and is a well known hot spring town in Western Japan. 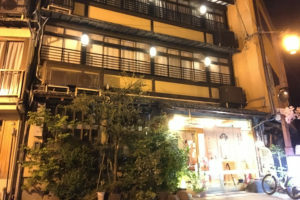 Many writers and artists have sojourned and set their works in the area, one such story being “Kinosaki Nite” written by Naoya Shiga. The main town area is centralized around a waterway. Beautiful willow trees line the Ootani River, which flows quietly through the center of the Onsen town district. Japanese style wooden hotels stand in a row along the banks. Indulge in the moment by strolling around the area and winding down in one of the seven Sotoyus, outdoor public baths. Here you can experience a favorite bath ritual: wearing breezy yukata robes and geta sandals. The onsens do have a charge, but travelers staying at the hotels may receive courtesy tickets that covers the bath but not garment fees. 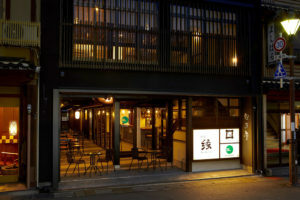 Kinosaki Onsen received 2 stars in the Michelin Green Guide Japan and thus many international travelers are seen lately wandering around in the yukata and getas, enjoying the local cuisine. The regional specialties include Tajima beef and fresh seafood, notably the Matsuba crab in autumn and winter. 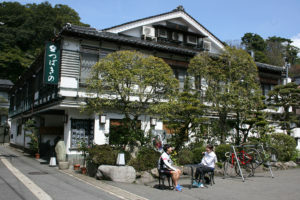 Kinosaki Onsen serves as the base to a variety of cycling routes. 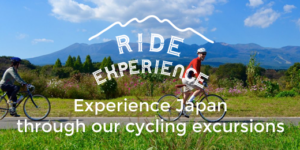 Including the Sanin Coast, a registered World Geopark site for its complex terrain and stunning light blue sea, a dynamic hill climb route in Kannabe kogen, refreshing and smooth road along the Maruyama river etc.. 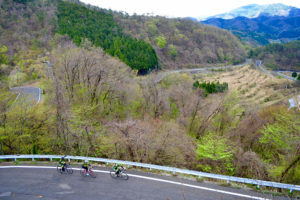 There is a community for cycling enthusiasts by the alias of “Kinosaki Chari Danna”, the Kinosaki Young Masters Cycling Club. 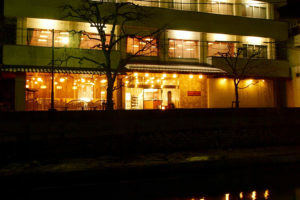 It is managed by the younger masters of ryokans (Japanese style hotel) in the region. The Dannas host a LONG RIDE every September to promote community revitalization. The ride is called “Kounotori Challenge Ride” to honor the regional and endangered bird, the stork. The touch of willow trees and Japanese ryokans lining the Ootani River. Wearing these Yukatas and Geta clogs is quintessential to a trip to a Kinosaki Onsen. “Ichi no Yu” is the most popular Sotoyu, adored for its cave bath. 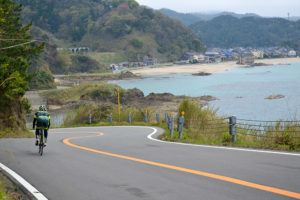 The winding road along the Sanin seaside, registered by World Geopark, has repeated up and down routes that overlook the beautiful light blue sea. On a hill climb route in Kannabe Kogen. The last two kilometers is a zigzagging nine percent slope. Storks are an endangered bird and one of the Japan’s Special Natural Monuments. In Toyooka City including the area of Kinosaki Onsen, some storks raising their babies on a manmade nesting tower. “Kinosaki Chari Danna”, the younger masters of ryokans wearing cycling uniform with a red onsen emblem, are waiting to welcome cyclists with great hospitality.